'Twas a month before winter... well, actually it is 26 days until true winter which begins on December 21st. The only blooms left are in the sun room. 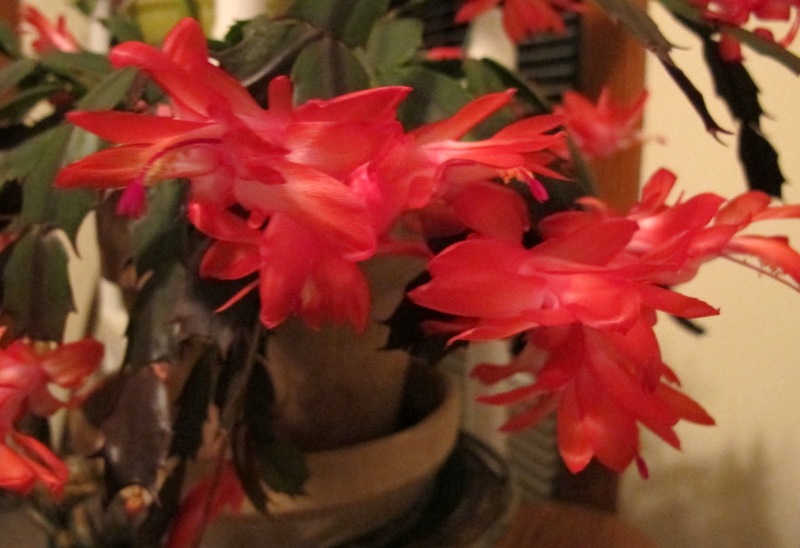 I'm currently enjoying these orange, orange, orange Thanksgiving cactus blooms. 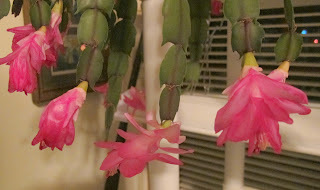 I have separated them from some hot pink Thanksgiving cactus blooms because even someone as color-challenged as I sometimes am can see that these clash. Out in the garden proper, over the last month I moved everything out of winter's way, either stowing it under tarps on the patio or cramming it into the garage. I planted over 1,500 bulbs and six trees. I also cut back some of the more rampant self-sowing perennials, like asters. I'll still end up with hundreds of seedlings of aster to pull in the spring, but that is better than thousands of seedlings. I am only slightly nagged by the thistle and henbit still out in the garden. Give me one decent sunny Saturday or Sunday afternoon with temperatures above freezing and I promise I'll go out and weed out most of those. I am a tiny bit very concerned that the rabbits will cut their little rabbit teeth this winter on my newly planted apple trees. That would not please me. To get rid of this concern, I plan to put some chicken wire or hardware cloth around the trunks of the apple trees, at least for the winter. While I have the wire cutters out, I think I will also protect the other three trees I planted. 'Twas a month before winter... actually 26 days before true winter arrives on December 21st. I think the garden is ready. I think I am ready. Now, what nice, warm rabbit hole should I fall down into this winter? I've been skirting around the edges of one, and think if I just take one step forward toward it, I could fall in and spend an entire winter exploring it, emerging just in time for spring. We can't wait to find out what magical rabbit hole will trip you into taking an educational, absorbing "trip"! My own personal rabbit hole will be researching woodland butterflies and what nectar plants I need to plant to lure them in; especially the Zebra and Spicebush Swallowtails to use the multitude of host plants our woods offer. I can't wait to read about your rabbit hole! I too would love just one more day to cut back some Artemesia Guizhou and a patch of an un-named astilbe look-alike. Maybe this week? Heidi: don't know about zebra swallowtails but to attract spicebush, you want to plant either Spicebush (Lindera benzoin) or Sassafrass. I have five Spicebush, though, and haven't seen the cats yet. Keeping my fingers crossed, though. Looking forward to finding out about the rabbit hole.